Here is a list of best free trigonometry calculator software. These free trigonometry calculator perform a number of tasks. You can find out the values of basic trigonometric functions with these freeware. These software can also be used to find the values of Inverse Trigonometric Functions, Hyperbolic Trigonometric functions, and Inverse Hyperbolic Trigonometric functions. You can choose the option to perform arithmetic operations on trigonometric functions with these software. The graphs of trigonometric functions can also be displayed using these freeware, so as to provide you an idea of different trigonometric functions. You can perform some other mathematical calculations in these software as well. You can also use some of these to solve trigonometric equations, and find out the missing values. Some software also display the process involved while solving problems. The answers can be viewed in either decimal, binary, hexadecimal, or octal. Out of all these free trigonometry calculator software listed here, I like Microsoft Mathematics the most. It is due to the fact that, here you can choose to find the values of Trigonometric Functions and Inverse Trigonometric Functions. You can also make use of triangle solver to know the missing values of a triangle, and also view the formulas used to calculate it. It can also be used to solve trigonometric equations and solve trigonometric problems using Law of Sines and Law of Cosines. You can also view some basic trigonometric identities and Trigonometric formulas. You can also check out the list of Best Free Geometry Calculator Software, Derivative Calculator Software, and Integral Calculator Software. 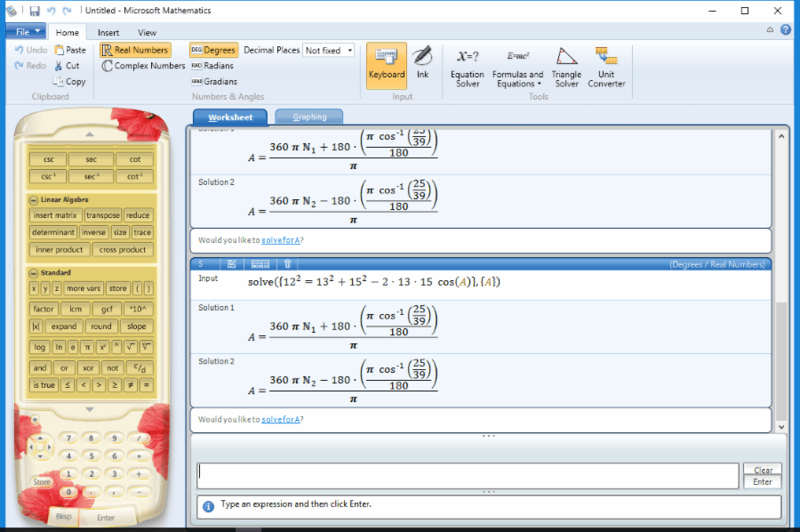 Microsoft Mathematics is a feature rich math calculator freeware. It also includes trigonometry calculator as a part of it. In the basic trigonometry calculator window, you are provided with the options to calculate values of basic trigonometric functions and their inverses. You can use it as Sine calculator, cosine calculator, tangent calculator, cotangent calculator, secant calculator, and cosecant calculator. Select a function for which the missing value is to be found out, then enter the known value. The value can either be entered in degrees, radians, or gradians. You can also edit entries and know their keyboard equivalents. It features a triangle solver, where you have to enter the known values, and the missing value is calculated automatically. It can be used to calculate triangle angles and triangle sides. Information about triangle type, values of altitude and area, and the trigonometric function rules that have been used in calculation of triangle sides and angles are displayed. This trigonometry calculator also provides some options under the Formulas and Equations tab. Here you can find the values of sine, cosine, tangent, cotangent, secant, and cosecant. You can also make use of some other trigonometric formulas, like: Law of Cosines and Law of Sines to find out the values of certain angles. All in all, its a good freeware to carry out various types of mathematical calculations, ranging from simple ones to complex ones. ATCalc is a simple calculator software, which can be used as a trigonometry calculator freeware. The best part of this freeware is that it features a programming environment where you can perform calculations and draw some geometric shapes by typing in commands. Single line calculation and multiple line calculations can also be performed. A number of functions are available, that can be used to calculate different mathematical functions, like: statistical, mathematical, and complex number calculations. It can be used to create your own mathematical formulas and functions. You can also define your own constants. The trigonometrical functions that can be calculated using this freeware are Sine, Cosine, Tangent, Cotangent, Secant, Cosecant, ArcSine (ArcSin), Hyperbolic Sine (SinH), inverse Hyperbolic Sine (ArcSinH), hypotenuse, and other trigonometric functions related to Inverse, Hyperbolic, and Inverse Hyperbolic. It can also be used to convert Degree to Radian or Radian to Degree. The results can be viewed either in decimal, hexadecimal, roman, or binary. In the Page tab, choose the option Trigonometrical from the drop down menu. Select the function that you wish to solve and enter the known values. Enter the number of significant digits and press Enter. This in turn displays the unknown values of trigonometric function. Octave is a very powerful mathematical calculator software. GNU Octave is a high-level interpreted language, quite similar to Matlab and can be used to solve linear and non linear problems. Its graphing capabilities help in data visualization and data manipulation. It features both Command Line Interface and Graphical User Interface to help you solve various mathematical problems and mathematical equations. It is a bit tricky to use, hence you need to have an idea of commands to solve the problems. It can be used to solve even the most complex problems. It features a command window, workspace, and command history window to let you type commands and view results. The editor tab lets you edit the commands. The whole documentation of commands is provided, that can be used as a reference. Different language commands of C++, Octave, Perl, Batch, etc. can be color coded differently. You can save workspace for future use. Here you can calculate values of some general trigonometric functions, like: Sine, Cosine, Tangent, Cotangent, Secant, Cosecant, inverse trigonometric functions, hyperbolic trigonometric functions, and inverse hyperbolic trigonometrical functions. Some of the trigonometric functions commands to calculate the values of trigonometric functions are: sind, cosd, tand, cotd, secd, and cscd. 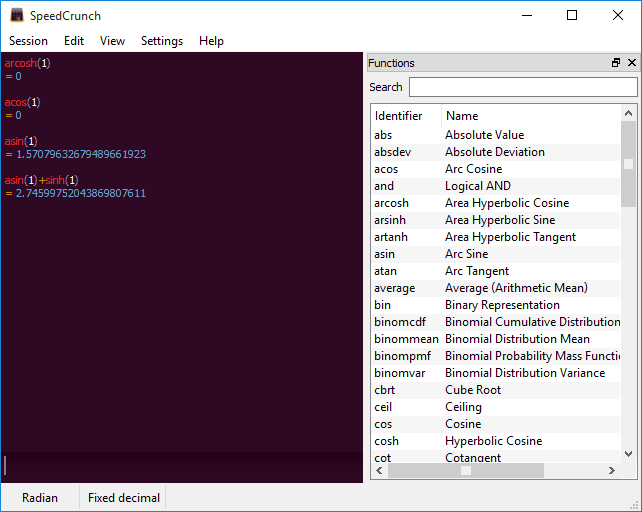 The same can be done to find out the values of each element of inverse trigonometric functions using the commands: asind, acosd, atand, acotd, asecd, and acscd. Apart from these, it can be used to plot graphs of trigonometrical equations and solve complex trigonometric problems. Advanced Trigonometry Calculator is a simple freeware that can be used to solve trigonometric problems. Apart from this, it can also be used to perform some other mathematical calculations as well. But in order to do so, you have to have basic knowledge of the commands used to achieve desired results. The most amazing part of this freeware is that, you can perform trigonometric calculations with complex numbers as arguments as well. You can also perform basic addition, subtraction, multiplication, division, etc. on trigonometric functions. This freeware can also be operated from command prompt. Equations written in text files can be calculated as well. Some of the trigonometric entities that can be calculated are: sine, cosine, tangent, cotangent, secant, and cosecant. Inverse, hyperbolic, and inverse hyperbolic trigonometrical functions. Precise Calculator is a simple open source mathematics calculator freeware that can be used as trigonometric calculator software. It works on fractions, complex numbers, lists, vectors, etc. It also makes use of both command interface, where you can add the commands IF, GOTO, PRINT, and RETURN and simple visual interface, which can be used to perform simple calculations. Use it to calculate sine, cosine, and tangent values of angles. You can also calculate the values of cotangent, secant, and cosecant by dividing 1 by the values of tangent, cosine, and sine values respectively. You can enter the values of angles in either Deg, Rad, or Grad. Results can be viewed in either Decimal, Hex, or Binary by clicking on appropriate buttons. The precision option can also be set from 1 to 9999999. Frequently used formulas can be saved as macros and the results can be written to a log file. You can also find out the values of inverse trigonometric functions, hyperbolic trigonometric functions, and inverse hyperbolic trigonometric functions by selecting the checkbox buttons Inv, Hyp, and both respectively. WiseCalc is an amazing scientific calculator that offers a number of tools to help you in performing several complex calculations. It features autocomplete and suggestion function. The best feature of this freeware is that, you can type command text in plain English and the values of different functions are displayed. Functions can also be selected through respective buttons. Different constants values are available to be used in calculations. 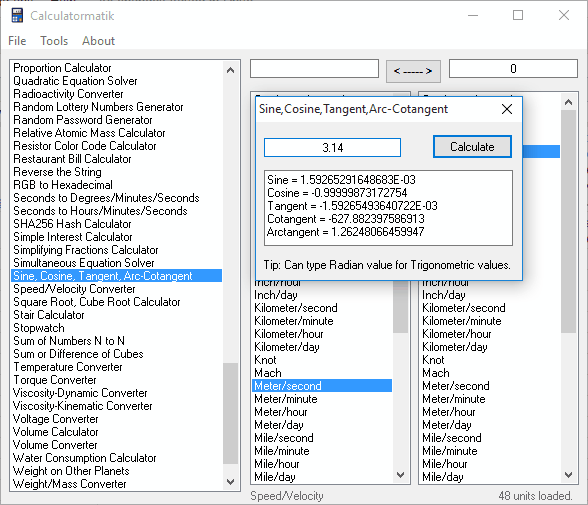 As a trigonometric calculator, it calculates the values of Sine, Cosine, Tangent, Cotangent, Secant, and Cosecant. You can also find out the values of inverse trigonometric functions and hyperbolic trigonometric functions. You can enter the trigonometric equations either by typing in the commands, or using the visual buttons. The calculations can be saved as WCP or TXT. It can be used to create either CalcPage or MatrixPage. It also provides different unit conversion and matrices calculation options. Farsight FreeCalc is a simple freeware that can be used as a trigonometry calculator. You can calculate the values of Sine, Cosine, Tangent, Cotangent, Secant, and Cosecant for various angles using this freeware. You can set the number of significant digits for precise calculation. Find out the values of inverse trigonometric functions, hyperbolic trigonometric functions, and inverse hyperbolic trigonometric functions here. It lets you carry out algebraic, angular conversions, date calculation, financial, statistical, and logical calculations as well. You can also create your own functions and change the skin of the software. The Finance box is also included that lets you calculate the time value of money, cash flow, interest rate conversions, and depreciation. Calendar Magic is a feature rich calendar freeware that can be used to perform a number of calculations. This features calendar and date calculator along with trigonometry calculator. To access trigonometric functions, go to Maths Utilities> Expression Calculator, or Maths Utilities> Scientific Calculator. This trigonometry problem solver can be used to calculate the values of sine, cosine, and tangent values of angles. Values of angles can be entered in Degrees or Radians. Here you can also calculate the values of inverse trigonometric functions, hyperbolic trigonometric functions, and inverse hyperbolic trigonometric functions. Algebraic calculations like: addition, subtraction, multiplication, division, etc. can be performed using this freeware. GraphCalc is a simple freeware that can be used as a Trigonometric calculator. This freeware can be used to perform some complex calculations and draw the graphs. As a trigonometry calculator, this freeware can be used to find out the values of trigonometrical entities, with their inverse and hyperbolic functions. You can also perform some basic arithmetical calculations on these trigonometric functions. 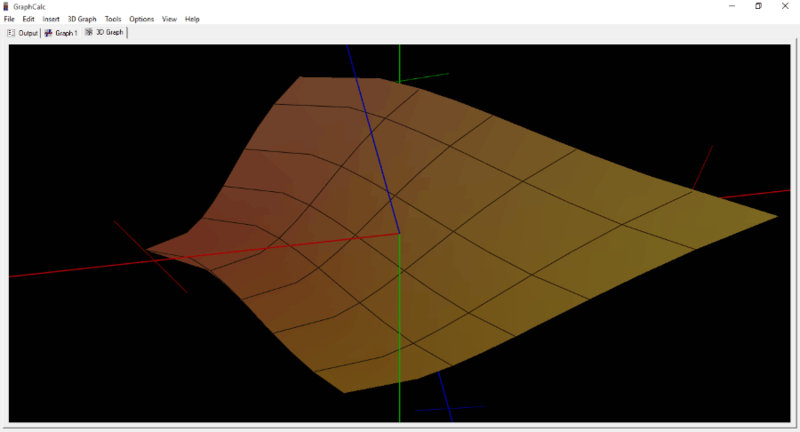 It lets you draw the graph of these functions in both 2D and 3D. When cursor is hovered over a rendered graph, you can find out the value for the solved function at that point. It can also be used to draw tangent over graph, calculate area under graph, and evaluate a function. The output can be saved as RTF or can be copied to clipboard. SpeedCrunch is a good multipurpose calculator which can be used as trigonometry calculator software. This freeware can be used to know the values of various trigonometric functions. You can either run the standalone application or install the software. SpeedCrunch can also be used to find out the values of inverse trigonometric and hyperbolic trigonometric functions. You can use it to calculate area of hyperbolic functions as well. Addition, subtraction, multiplication, and division on these trigonometric entities can also be performed. Enter values in either Radians or Degrees. The result output format can be chosen to be either in decimal, binary, octal, or hexadecimal form. Calculator Pro is a simple freeware to solve minor trigonometrical problems. It can be used to find out the values of trigonometric functions, inverse trigonometric functions, hyperbolic trigonometric functions, and inverse hyperbolic trigonometric functions. Use it to render 2D and 3D graphs of calculated functions. Enter either single line command or multiple line commands to get result. Addition, subtraction, multiplication, division, etc. of trigonometric functions can also be done. Various other mathematical calculations can be carried out here as well. Windows 10 contains a simple Calculator that can be used as a trigonometric calculator. In order to access it, you have to choose Scientific Calculator view of the calculator. Here you can find trigonometric values along with their inverse functions. To find out the values of cotangent, secant, and cosecant, you have to divide 1 by the values of tangent, cosine, and sine respectively. Values can be entered in DEG, RAD, or GRAD. It also features standard calculator, programmer calculator, and converters. Use Euler Math Toolbox to perform mathematical calculations. It supports a number of trigonometric functions. Use it to find the values of inverse trigonometric functions, hyperbolic trigonometric functions, inverse hyperbolic trigonometric functions, etc. You can also perform several arithmetical calculations on it. 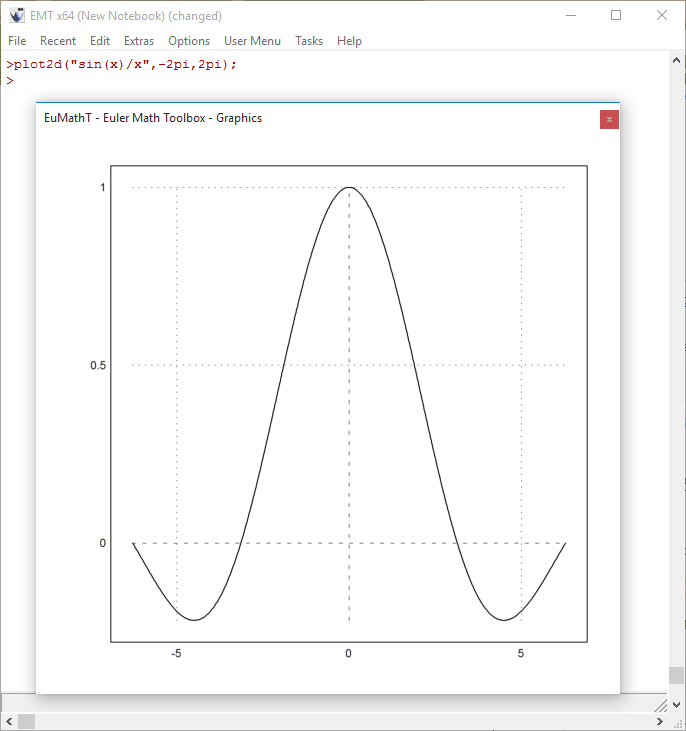 It can also be used to plot graph of trigonometric functions. The graphs can be copied to clipboard or exported. 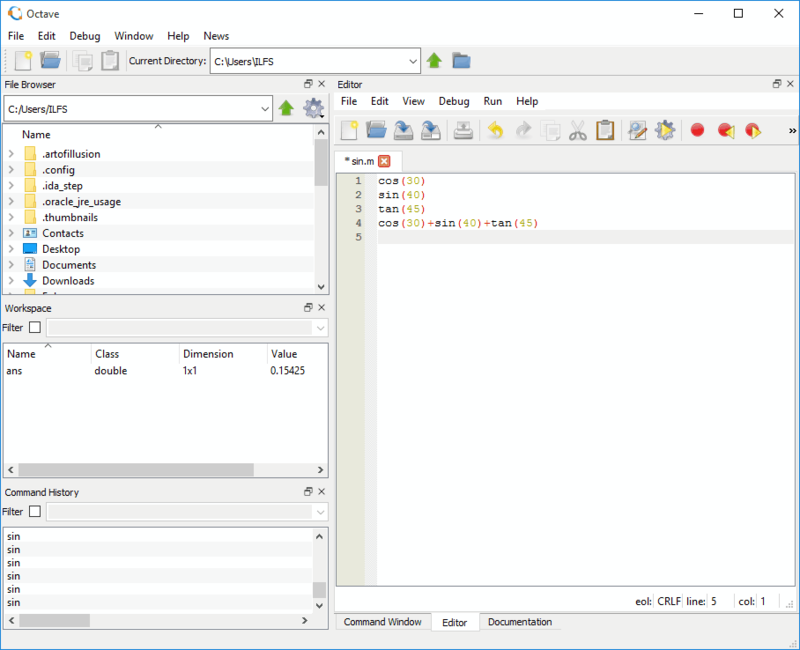 Euler Math Toolbox is bit complex software to use, although it is quite powerful. Here you can enter both single line commands and multiple line commands to solve different types of complex mathematical equations. Calculations can be performed for real or complex number, vectors, and matrices. You can also type in LATEX formulas. Nexcal is a simple and easy to use math freeware. It contains upto 30 different functions to perform mathematical calculations, which includes trigonometry. It can calculate complete expressions separated by different mathematical symbols. Values to calculate trigonometric values can be entered in either Degree or Radian. Solutions can be saved in HTML or TXT. The results can also be displayed as fractions, decimal, binary, or hexadecimal. Different operators, functions, and variables can be put to use. TTCalc is another good trigonometry calculator freeware. It can be used to calculate values of inverse trigonometric functions as well. Use it to convert values between degrees and radians. Using this trigonometry solver, you can perform several operations on trigonometric functions, like: addition, subtraction, multiplication, division, root, square root, etc. Precision value for calculation can also be set. Apart From that it can also be used as arithmetic calculator, to perform logical operations, and as logarithmic calculator. You can also create your own functions, variables, and solve the equations. Set precision and display preferences manually. Calculatormatik is a calculator software with various calculators, which includes a trigonometry calculator. Here you can easily calculate values of Sine, Cosine, Tangent, and Arc-Cotangent by selecting them. A small window appears, where you have to enter angular value in radians. Physics calculator, Chemistry calculator, Mathematics calculator, etc. are available here. Calculator Prompter is a minimalist calculator that can be used as a trigonometry calculator software. The highlight of this software is its error recognition system. Use it to calculate the values of inverse trigonometric functions, hyperbolic trigonometric functions, and inverse hyperbolic trigonometric functions. It can also be used as a trigonometry solver to perform some calculations on trigonometric functions separated by addition, subtraction, multiplication, and division. 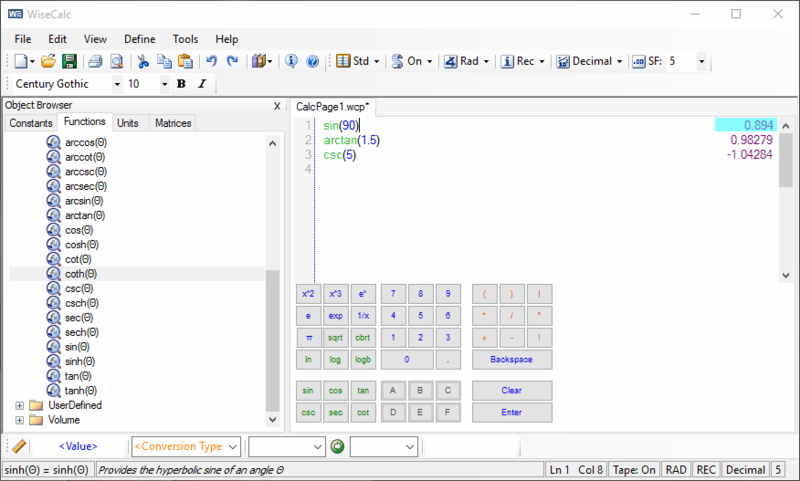 This freeware calculator can be used to perform calculations on whole expressions, including brackets and operators. ExpressionCalc is another simple freeware that can be used to solve trigonometrical expressions. It helps you solve trigonometric functions, like: Sine, Cosine, Tangent, Cotangent, Hyperbolic sine, hyperbolic cosine, etc. Few mathematical constants are also available here, which can be used in various calculations. Solve complex trigonometric functions separated by mathematical operators. You can also use this freeware to find out the missing values of expressions. Just enter the expression that you want to solve, enter the known values to get the solution. RedCrab Calculator is a simple trigonometry calculator freeware. It can be used to perform technical, scientific and financial calculations. Use this freeware to display calculations as presentations. Images and Text can be inserted to describe complex calculations. Find out the values of trigonometric functions, inverse trigonometric functions, and hyperbolic trigonometric functions easily. This freeware can perform complex calculations and plot Graph of the same. While basic calculations are quite simple to perform, solving complex equation turns out to be a bit tricky. The freeware versions of RedCrab Calculator offers limited functionalities. Hiper Calc is a good calculator freeware for Windows with the layout of a scientific calculator. It can be used to perform trigonometric calculations. Trigonometric expressions separated by addition, subtraction, multiplication, and division signs can be solved here. It can also be used to calculate GCD, LCM, logarithm, factorials, powers, roots, geometric, and hyperbolic functions. Macro Expression Calculator is a simple trigonometry calculator freeware that can be used to calculate the values of Sin, Cosine, and Tangent along with their inverse. You can also perform addition, subtraction, multiplication, division, power, OR, XOR, AND, and MOD operations on trigonometric functions. Other simple mathematical calculations can be carried out here. No other advanced features were found.